Euphorbia piscidermis is a very unusual collectors plant and one of the most remarkable of succulents. Description: This is a small succulent euphorbia covered with characteristic “fish-scales” that looks something like a small golf ball, It can branch slowly. When it is not in flower, no one would suspect it of being a euphorbia. Stems: Up to 12 cm tall, 7 cm in diameter covered with paste-white fish-scale like imbricate appendages. 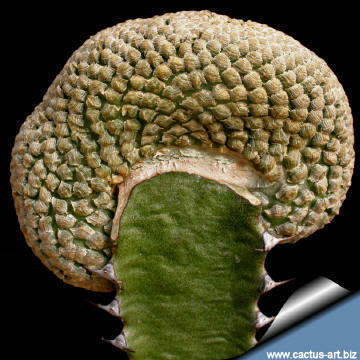 Cultivation: The crested form of the Fish Skin Euphorb is difficult to grow on its own roots, and is generally grafted for convenience on E. canariensis or E. resinifera. Frost Tolerance: Need frost protection. Sun Exposure: Light shade. Photo of conspecific taxa, varieties, forms and cultivars of Euphorbia piscidermis. The stem is closely shingled with scale-like appendages. 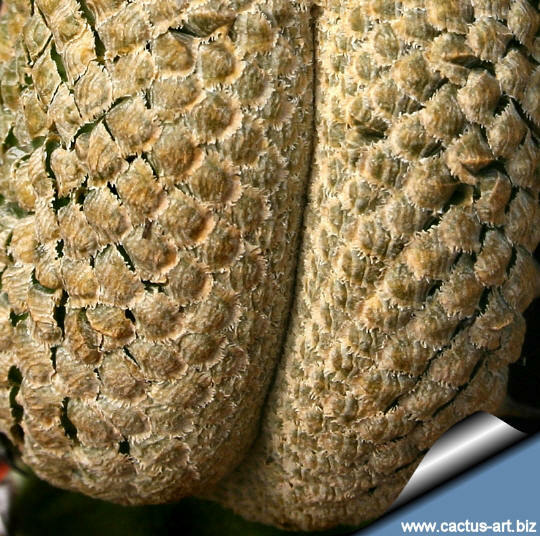 (The name 'piscidermis' comes from the Latin for 'fish-skin', refering to the scale-covered skin) such scales being otherwise unknown in the genus Euphorbia. Grafting: The plants that are grafted on a more vigorous and easier stocks are easier to keep, grow faster and produce more flowers and seeds. 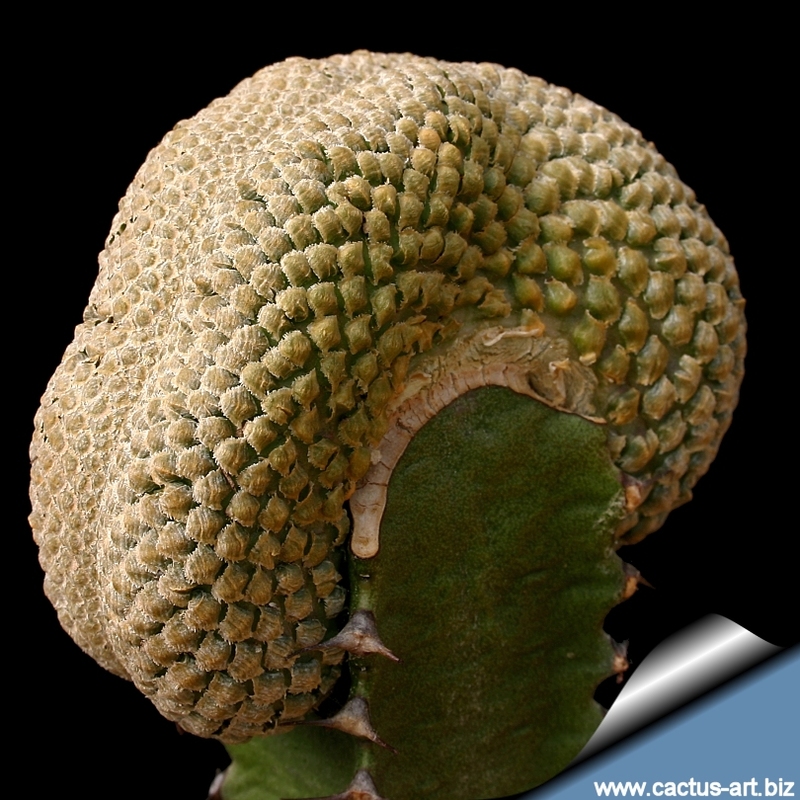 The method of grafting euphorbias differs little from that of other succulents, except in one important aspect. The latex must be washed or sprayed off until hardly anything remains. After the latex flow has stopped, a further 1-2 mm slice can be taken from both surfaces without a new latex flow starting. Both scion and stock need to be at the start of the growing season. The stock should be cut as near as possible to the growing tip, as here the vascular bundles are dense and not yet woody and will feed the scion in the best possible way. Where possible stock and scion should be of similar diameter. The cut surfaces are held together with elastic bands in cross style, over the plant top and under the pot. The plants should be left in an airy and shady place for 7-10 days before the bands are removed.